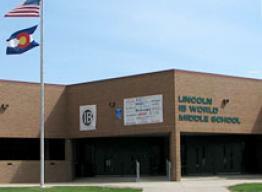 Lincoln Middle School, the first middle school in Fort Collins, is an International Baccalaureate (IB) World school. Lincoln’s IB Middle Year’s Programme focuses on rigorous instruction in a nurturing environment that fosters whole child development through collaboration and international mindedness. State-of-the-art technology is used to advance 21st century skills through engaging interdisciplinary units. Grade-level teams create effective support structures for each student. Accelerated opportunities in math, science, and english are also offered. Extensive service-learning projects such as international art exchanges, creating books for third-world countries, and writing memoirs for local senior citizens are the examples of programs in which Lincoln students are engaged. Lincoln has outstanding music and art programs; visual arts students consistently win state and national honors. Students also excel in the many extracurricular programs offered including athletics, Talent Search, International Community Builders, Science Olympiad and the district’s only middle school student-produced daily television show.